It’s a busy week ahead on the area astronomy calendar as four club events, a seasonal observance, and a monthly get-together are on the docket. Astronomy on Tap Seattle observes its second birthday this month, and will celebrate with a rare Friday gathering at 7 p.m. March 24 at Peddler Brewing Company in Ballard. The evening’s talks will be a retrospective of the last year and updates of what’s happened in a variety of areas. Topics include gravitational waves, keeping stars weird, exoplanet discoveries galore, the Large Synoptic Survey Telescope, when a star is not really a star, and more! There will be a trivia contest and cool prizes as always. It’s free, but buy a beer or three. The Rose City Astronomers plan their monthly meeting for 7:30 p.m. Monday, March 20 at the OMSI auditorium in Portland. Guest speaker Steve Gottlieb has a fascinating story to tell. Gottlieb recently completed observing the entire New General Catalogue of Nebulae and Clusters of Stars (NGC for short.) That project took him more than 35 years to finish—the NGC lists 7,840 deep-sky objects! The NGC was compiled by astronomer John Dreyer in the late 19th century, but there were various errors on between 15 and 20 percent of the objects. Gottlieb will discuss the NGC/IC Project, a joint amateur-professional effort to re-examine the 100 to 200 year-old source material used by Dreyer. The Eastside Astronomical Society will hold its monthly meeting at 7 p.m. Tuesday, March 21 at the Lake Hills Library in Bellevue. EAS member Tom Hager will continue his look at Burnham’s Celestial Handbook. He’ll focus on the constellations Canis Major and Canis Minor, and the dim constellation Monoceros (the Unicorn) that lies between them. Emphasis of the talk will be on what we’ve learned in the 40 years since Robert Burnham published this classic astronomy reference collection. The Tacoma Astronomical Society will hold one of its public nights at 7:30 p.m. Saturday, March 25 at the Fort Steilacoom campus of Pierce College. The indoor, all-weather presentation will be about ancient astronomy. If the sky is clear they’ll break out the telescopes for some observing. The Island County Astronomical Society plans a star party at dusk Friday, March 24 at Fort Nugent Park in Oak Harbor. Join Alice Enevoldsen of Alice’s Astro Info to watch the first sunset of spring from Solstice Park in West Seattle. Gather at the park at 6:45 p.m. Monday, March 20 for Enevoldsen’s 32nd seasonal sunset watch. The official charts put sunset at 7:23 p.m., but Enevoldsen has found it’s typically about 10 minutes earlier at that location. The fourth and final presentation of Mars Madness will be given at 2 p.m. Saturday, March 25 at the Museum of Flight. Guest speaker Dr. Sanlyn Buxner, an education specialist and research scientist from the Planetary Science Institute in Tucson, Arizona, will give a lecture titled, “Mars 201: Mission Accomplished.” Buxner will highlight the outstanding achievements and magnificent failures of more than 40 years of Mars mission science and engineering. The Washington State University Planetarium in Pullman will run a show titled, “Other Earths” this weekend. The presentation highlights the ongoing search for planets in the Milky Way. How many planets are there? How many could support life? Is there life out there? How much we know might surprise you. Shows are scheduled for 7 p.m. Friday, March 24, and 5 p.m. Sunday, March 26. Tickets are $5 at the door, cash or check—no credit cards. The Willard Smith Planetarium at the Pacific Science Center in Seattle offers a variety of shows each day. Their complete schedule is featured on our calendar page. You can also learn of events from our postings on Facebook and Twitter. Saturn slides up close to the Moon in the predawn hours on Monday. The Sky This Week from Astronomy magazine and This Week’s Sky at a Glance from Sky & Telescope offer more observing highlights for the week. This entry was posted in astronomy, calendar and tagged Alice Enevoldsen, Sanlyn Buxner, Steve Gottlieb, Tom Hager on March 19, 2017 by Greg Scheiderer. A visit from astrophysicist Neil deGrasse Tyson, the final Jacobsen Observatory open house of the year, and a seasonal sunset watch are the highlights of this week’s calendar of astro-events in the Seattle area. Tyson, director of the Haden Planetarium in New York, narrator of the recent Cosmos television series, author, and host of the StarTalk radio show and podcast, will speak at Seattle’s Paramount Theatre on two nights this week, Wednesday, September 21 and Thursday, September 22, both at 7:30 p.m. Some tickets are still available for both appearances. Join Alice Enevoldsen of Alice’s Astro Info at Solstice Park in West Seattle at 6:30 p.m. Thursday, September 22 to enjoy the first sunset of autumn. The equinox sunset watch will be Enevoldsen’s thirtieth such event, part of her NASA Solar System Ambassador service. The event is free, low-key, and always informative. The final open house of the year is set for 8 p.m. Wednesday, September 21 at the Theodor Jacobsen Observatory on the University of Washington campus in Seattle. The talk for the evening, reservations for which are already all spoken for, will be by student Anya Raj, who has been interning with NRAO-NM over the summer and who has built a dual-dipole radio telescope. Raj will talk about amateur radio astronomy and making your own radio telescope. Volunteers from the Seattle Astronomical Society will be on hand in the observatory dome to conduct tours and, if the sky is clear, offer looks through its vintage telescope. The popular open house series will be on hiatus for the fall and winter and will resume in April. The Seattle Astronomical Society will hold its monthly meeting at 7:30 p.m. Wednesday, September 21 in room A102 of the Physics/Astronomy Building on the University of Washington campus in Seattle. Guest speaker Ethan Kruse, a graduate student in astronomy at the UW, will talk about Proxima Centauri b, the exoplanet recently found orbiting our nearest stellar neighbor. Kruse will discuss how much we know about the planet right now, and what we might learn in the coming years. By way of preview, check our articles about a talk by Kruse at an Astronomy on Tap Seattle event from earlier this year, and about a presentation by Prof. Rory Barnes at Pacific Science Center last month exploring the potential habitability of the planet. The Tacoma Astronomical Society plans one of its public nights for 9 p.m. Saturday, September 24 at the Fort Steilacoom campus of Pierce College. The indoor presentation will be about the reasons for the seasons as we shift into fall. Weather permitting, club members will have telescopes out for looking at the sky. The ice giants Uranus and Neptune are well-placed for observing this week. The Sky This Week from Astronomy magazine and This Week’s Sky at a Glance from Sky & Telescope offer additional observing highlights for the week. This entry was posted in calendar, lectures, observing and tagged Alice Enevoldsen, Alice's Astro Info, Anya Raj, Ethan Kruse, Neil deGrasse Tyson, Seattle Astronomical Society, Tacoma Astronomical Society, Theodor Jacobsen Observatory on September 20, 2016 by Greg Scheiderer. Happy solstice! Winter arrives officially in the Northern Hemisphere at 8:48 p.m. Pacific Standard Time today. Celebrate the solstice a little early this evening and watch the final sunset of autumn with Alice Enevoldsen of Alice’s Astro Info at the aptly named Solstice Park in West Seattle. The festivities get under way at about 3:45 p.m. on Monday, December 21. The official time for sunset today in Seattle is about 4:20 p.m., but Enevoldsen, who has done 26 of these seasonal sunset watches, notes that it’s usually about 10 minutes earlier than listed for this site because of the altitude of the horizon. Enevoldsen is a NASA Solar System Ambassador and gives a good talk about how the solstice works and other celestial topics. Warning: heavy rain will scrub the event. Speaking of heavy rain, the forecast is not looking promising for viewing of the annual Ursid meteor shower, which will peak on Tuesday and Wednesday, December 22-23, with the best viewing expected before dawn on Wednesday. The shower is so named because its radiant appears around the bowl of the Litter Dipper–Ursa Minor. An article from EarthSky explains all you need to know about viewing the Ursids. This Week’s Sky at a Glance from Sky & Telescope and The Sky This Week from Astronomy magazine suggest other observing highlights for the week, including the chance to see comet Catalina in the early morning hours. We like to celebrate birthdays at this time of year, and there are two big ones in astronomy this week. We remember Isaac Newton, who was born December 25, 1642, and Johannes Kepler, born December 27, 1571. What would we know about planetary motion without these two? Keep current on area astronomy events by bookmarking the Seattle Astronomy calendar. This entry was posted in calendar and tagged Alice Enevoldsen, Alice's Astro Info, Ursid on December 21, 2015 by Greg Scheiderer. Touchdown confirmed! Curiosity lands safely on Mars! In what is arguably the nation’s greatest engineering achievement in space, NASA‘s Mars Science Laboratory Curiosity landed safely on Mars a little after 10:15 p.m. Pacific Daylight Time Sunday. 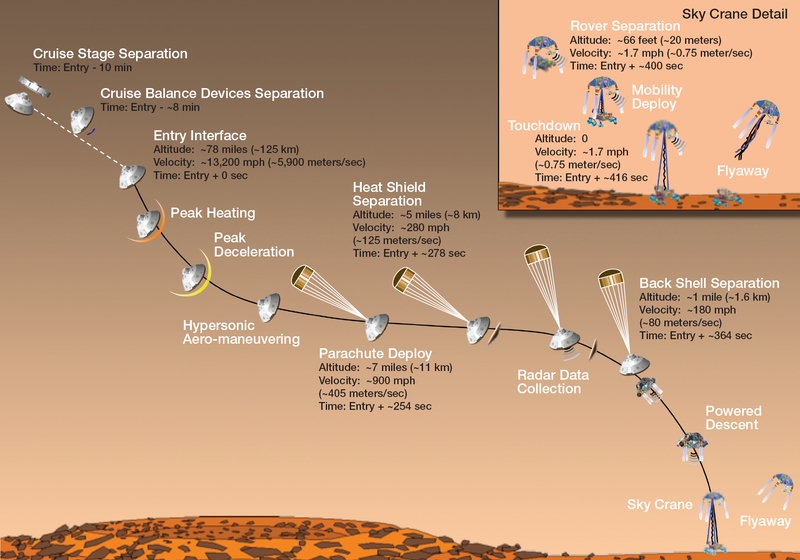 Because of the distance from Earth to Mars and the time it takes communication to travel between the two, we didn’t know until 14 minutes after it happened that a complicated landing plan worked. Alice Enevoldsen of Alice’s Astro Info, a NASA Solar System Ambassador, hosted a gathering at the Kenney in West Seattle to watch NASA TV coverage of the landing. “This has already happened,” Enevoldsen said of the time delay. “It’s just like the NBC Olympics!” she quipped. The Curiosity landing has at least one big Washington state connection. Rob Manning, flight system chief engineer at NASA’s Jet Propulsion Laboratory, attended high school in Burlington and is a 1980 graduate of Whitman College in Walla Walla. Coincidentally, Enevoldsen also is a Whitman alum. Mars fans gather after the successful landing of "Curiosity" to check out model rovers and Mars maps to learn more about the science mission. Photo: Greg Scheiderer. It’s interesting and encouraging that the landing drew such a crowd late on a warm summer Sunday evening. While a number of those who attended are residents of the Kenney, a retirement community in West Seattle, local media such as the West Seattle Blog and Seattle Astronomy spread the word, and many visitors attended as well. After the excitement of the landing many of the attendees gathered around a table set up with model rovers—including some made from Lego blocks—and looked at maps of Mars with the various spacecraft landing sites marked. Enevoldsen fielded questions from many of those in attendance. We understand there was a good crowd at the Mars Fest at the Museum of Flight as well. It’s encouraging to see the interest in the mission and the excitement about the successful landing. NASA administrator Charlie Bolden was clearly both relieved and elated with the successful landing. The mission is a pricey one, at $2.5 billion, and a crash landing would have been demoralizing to say the least. Afterwards Bolden, speaking to the NASA TV audience, called it “a huge day for the American people.” National pride aside, it has to be good for NASA to pull off a big success in these days of shrinking budgets. Energizing the public and impressing the folks with the purse strings can only help. Getting to Mars was the hard part; now Curiosity and its arsenal of scientific instruments can go about the business of poking around Mars for evidence that our neighbor planet has supported or could support life. We’re curious to see what it finds. This entry was posted in aerospace, astronomy, space and tagged Alice Enevoldsen, Alice's Astro Info, Curiosity, Mars on August 6, 2012 by Greg Scheiderer. The Museum of Flight had a full-size model of the Mars Science Lab Curiosity on exhibit back in 2010. The real one is set to land on Mars next Sunday. Photo: Greg Scheiderer. At least two public gatherings are planned in Seattle for watching the historic landing attempt. Alice Enevoldsen of Alice’s Astro Info, a NASA Solar System Ambassador, will host a viewing event at The Kenney, 7125 Fauntleroy Way SW in West Seattle, beginning at 10 p.m. August 5. At the Museum of Flight they’ll celebrate MarsFest 2012 beginning at 6:30 p.m. that evening. Events will include Mars-related family activities and games, Mars exploration and spaceflight engineer speakers, and a live link-up with The Planetary Society’s Planetfest 2012 in Pasadena, starring Bill Nye. The actual landing is scheduled for about 10:30 p.m. Pacific Time August 5; if you don’t want to be out late that evening you can watch the coverage of the landing on NASA TV. That coverage begins at 8:30 p.m. Pacific. NASA engineer Kobie Boykins, who worked on the Mars Exploration Rovers Spirit and Opportunity, gave a talk in Seattle back in May of 2010 about the challenges of making a successful landing on Mars, calling the time of radio silence between safe landing, or crash, “six minutes of terror.” NASA has pushed that up to seven minutes for Curiosity, which is a much more challenging landing because the rover is much bigger, and cannot land with the inflatable bouncing balls used with the previous smaller rovers. If you’re not up to speed on the Curiosity mission, the video of the NASA news conference below, published July 16, includes a lot of information about the mission and landing day. This entry was posted in aerospace and tagged Alice Enevoldsen, Alice's Astro Info, Curiosity, Museum of Flight, NASA on July 29, 2012 by Greg Scheiderer.